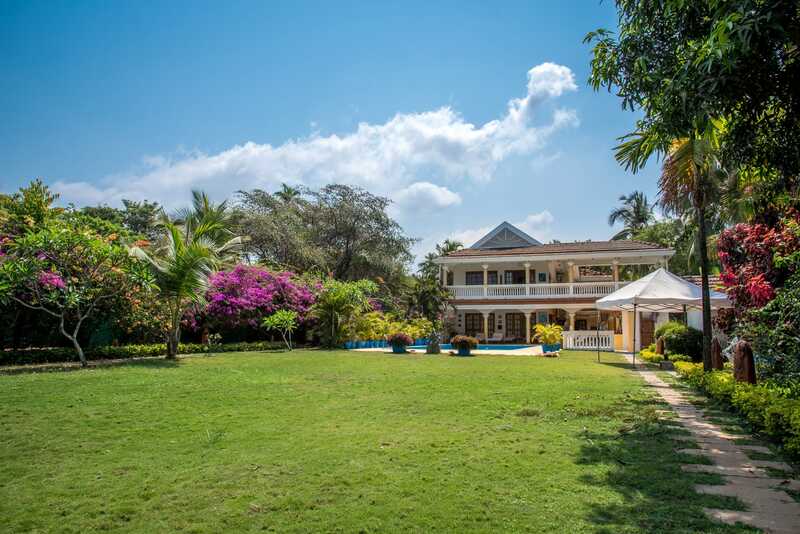 This beautiful beach villa is set in an acre of landscaped garden with swimming pool. 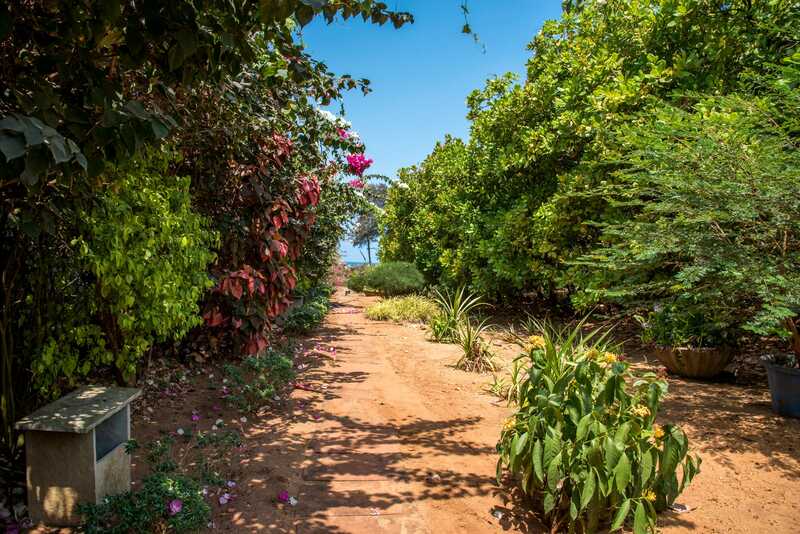 The garden extends right up to the beach with its own private gate, which is particularly convenient for early morning and evening walks along the sandy beach giving easy access to the house after swims in the sea. 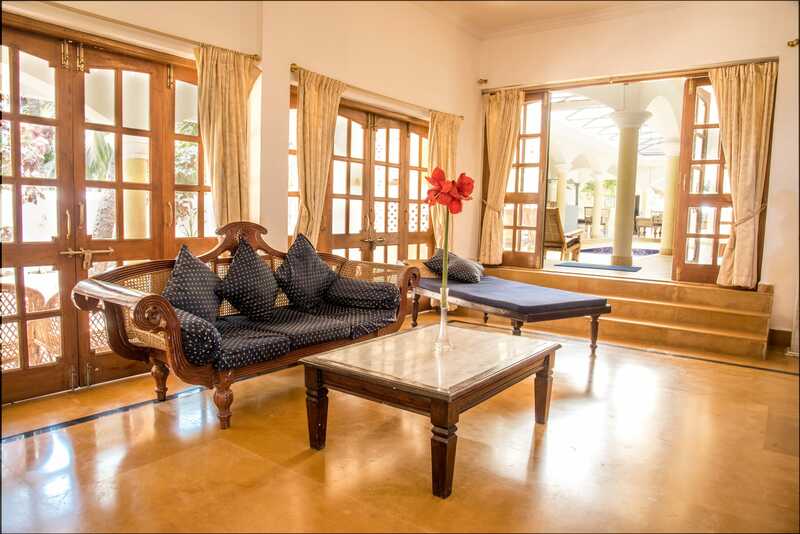 It has to be one of the finest beach side villas in North Goa. 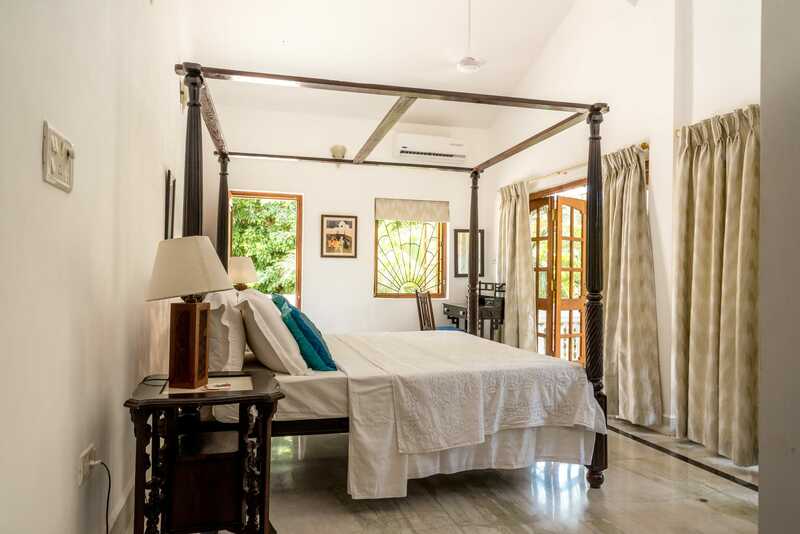 It is elegantly styled and classically designed villa, furnished with local traditional Goan/Portuguese style furniture much of which has been specially designed and made for the owners. 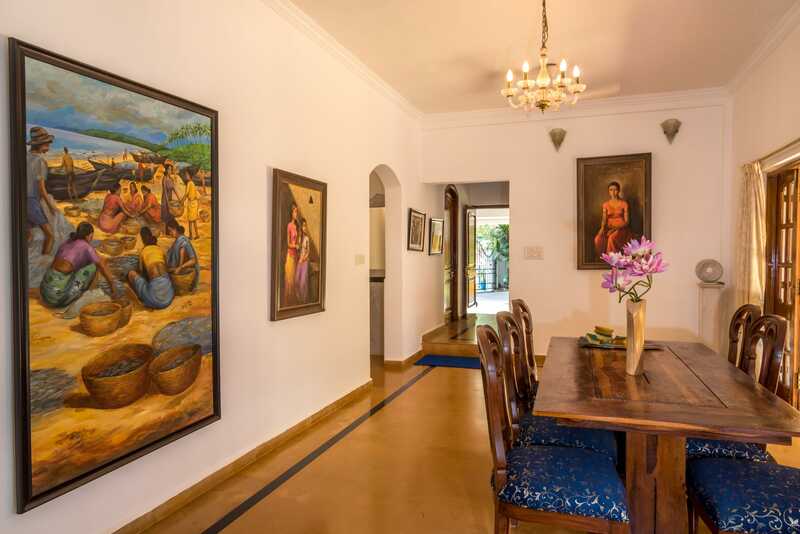 The villa contains a collection of sculptures , artworks and paintings , some by Goan artists, carefully selected by the owners and hung throughout the house.The villa is located in a peaceful , secluded and highly desirable residential area yet within a few minutes walk from some of the best shops, bars and restaurants in Candolim. 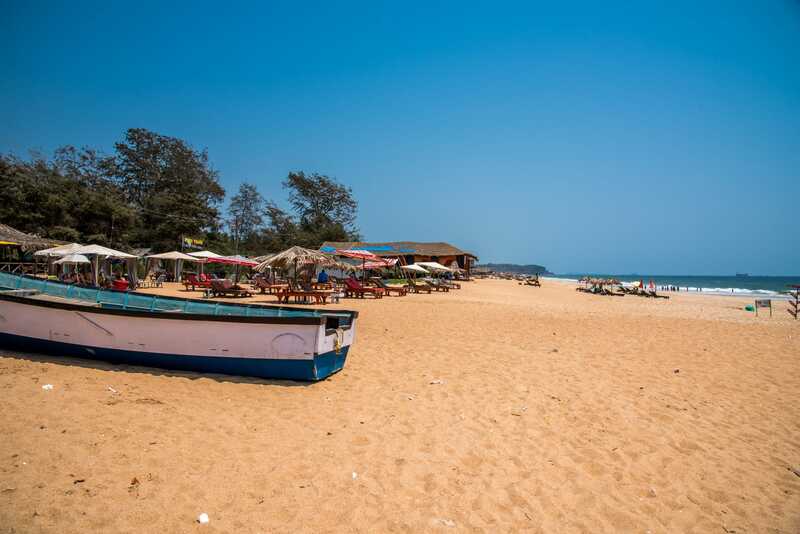 It is hidden at the end of a meandering lane which comes off the Candolim/Calangute Road. 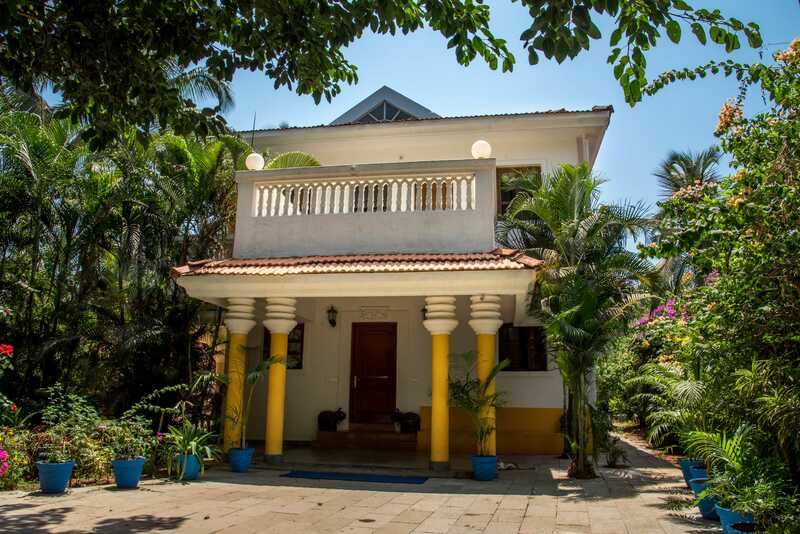 There are no roads around the villa compound so the villa enjoys complete privacy and peace . 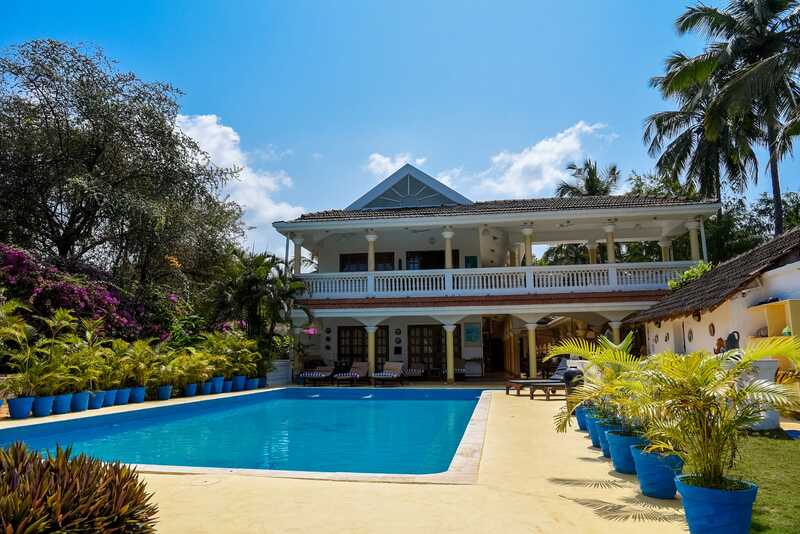 Large cast iron front gates, traditional front porch with columns and built-in seating including around a banyan tree in a courtyard bordered by bougainvillea and Rat-ki-rani give only a hint of what will be found as you enter the very substantial villa. 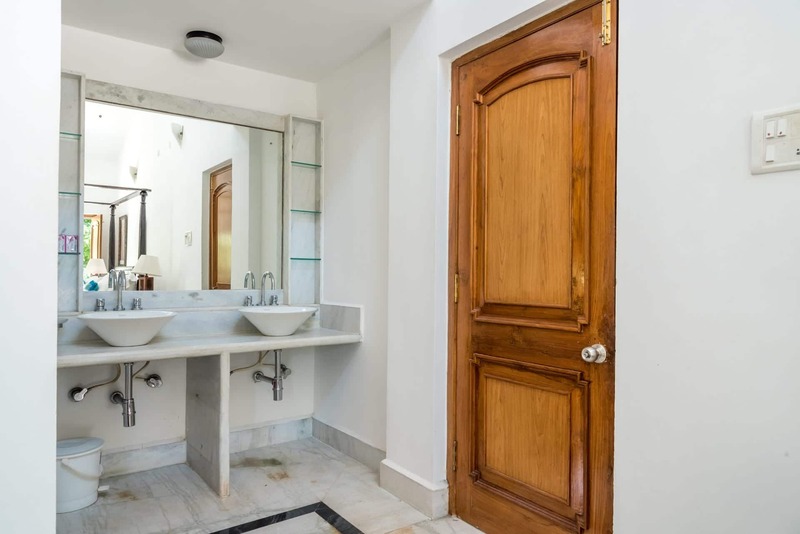 The villa has two storeys and consists of two wings connected by colonnaded terraces on both floors, designed around a marbled central courtyard featuring a Moroccan style waterbody with a fountain which forms a focal point for the house. 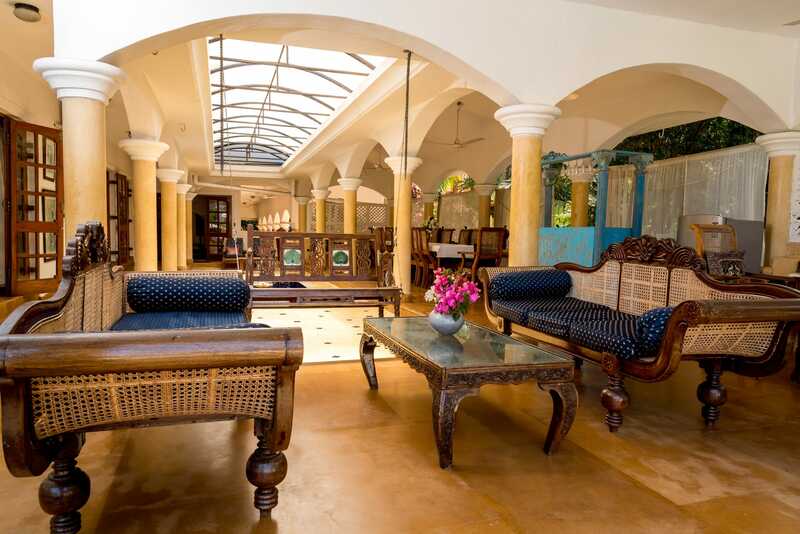 This large covered courtyard area contains a specially made Rajasthani style bar, has a long dining table with seating for 16 people, as well as easy chairs, antique marble tables, built in seating and heritage style caned back sofas. 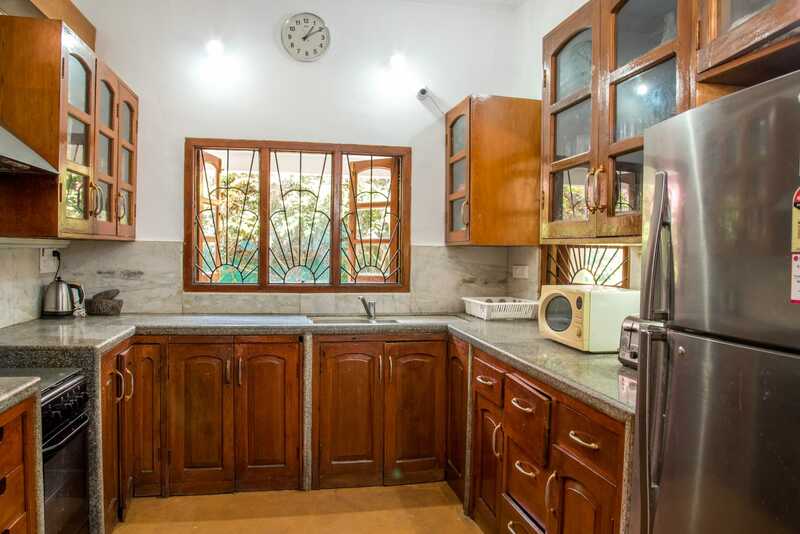 This courtyard provides an ideal area for relaxing, playing games, listening to music or simply relaxing and enjoying the peace and quiet with family and friends. 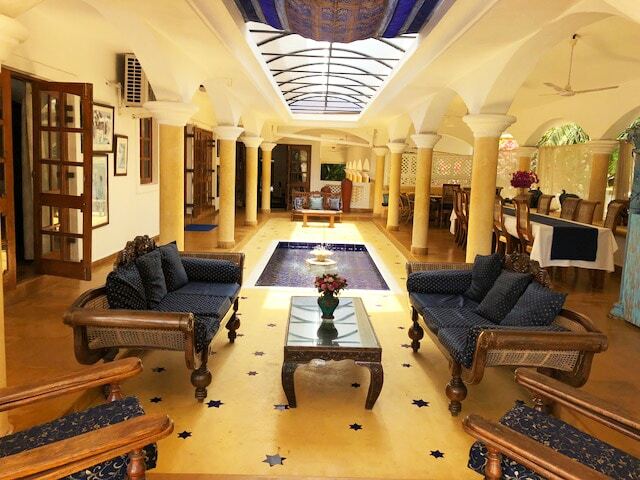 It looks out onto the poolside terrace and the landscaped gardens and sculptures beyond. 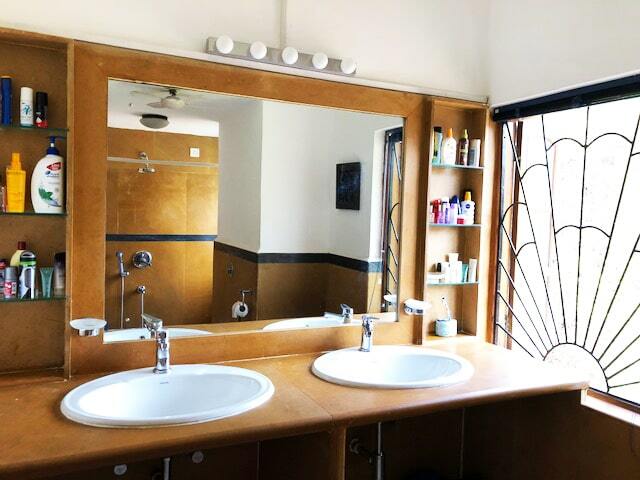 ACCOMMODATION.The accommodation consists of 7 ensuite double bedrooms and 2 bed sitting rooms with single day beds adjoining 2 of the bedrooms ( all together sleeping 14 +1+1 ) . 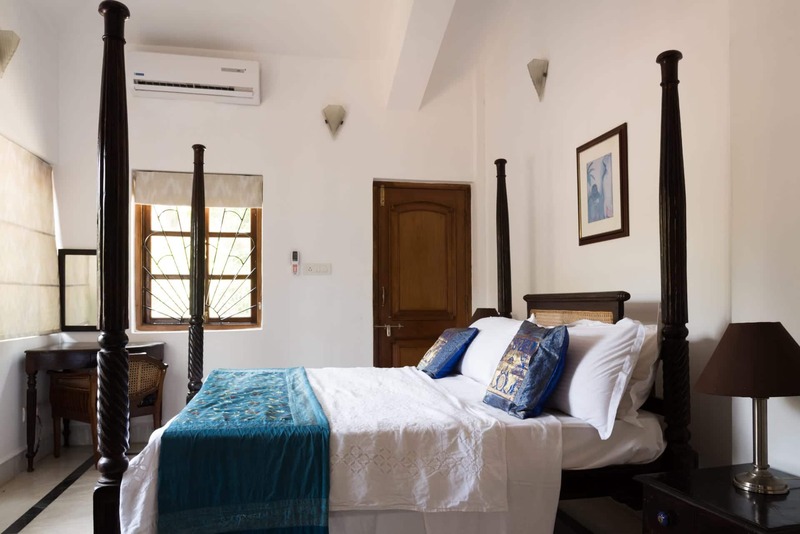 All the bedrooms including the bed sitting rooms have air conditioning. 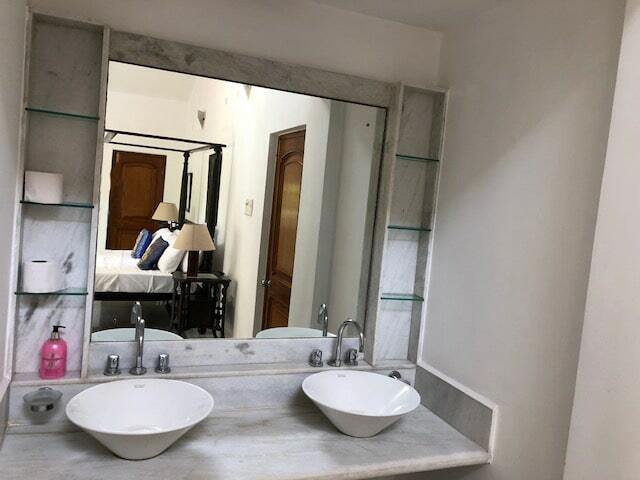 The master bedroom suite is on the 1st floor and consists of a double bedroom with a specially made four poster bed, built in wardrobes, adjoining large marble bathroom and a large bed sitting room with kitchenette, TV, two sofas and a daybed, opening out on to a superb balcony with views over the swimming pool and glimpses over the Arabian Sea, ideal for group cocktails while watching the sunset or doing Yoga (mats available) or for having a message (message by request, bed provided). 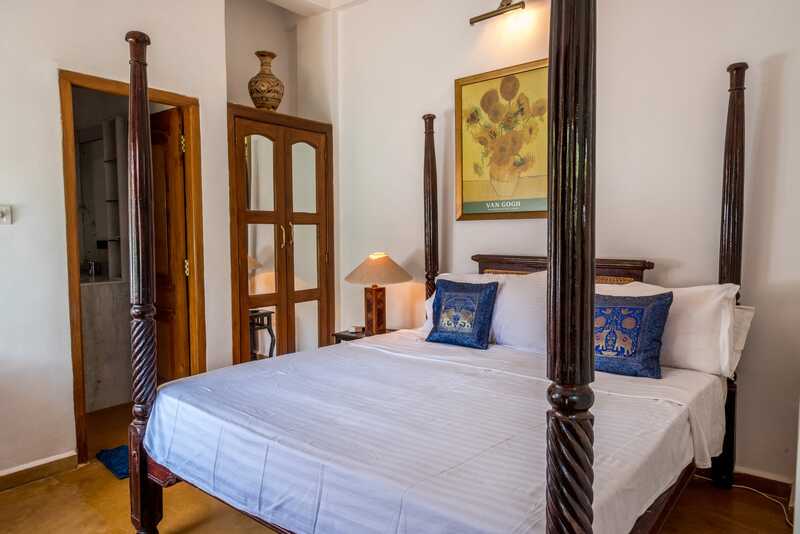 Downstairs from the master suite are 2 en-suite bedrooms that open out to the pool terrace with specially made 4 poster beds and antique Goan wardrobes. 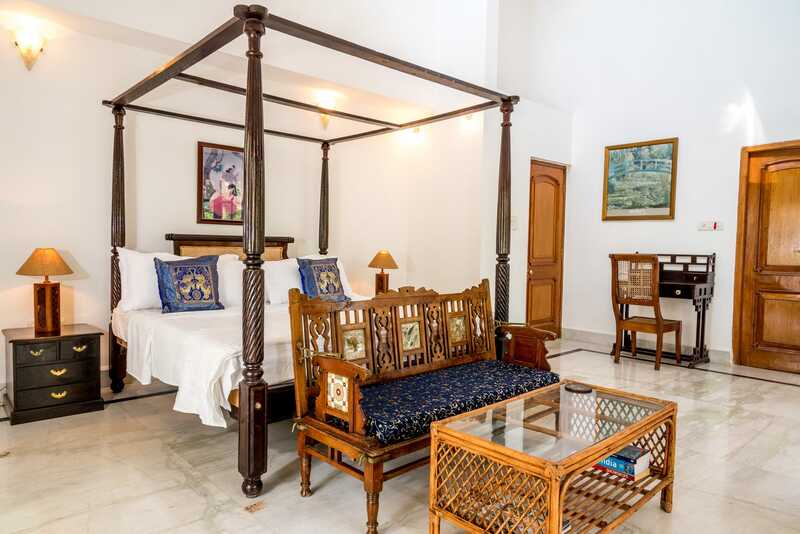 These bedrooms adjoin a bed sitting room with a day bed, antique sofa, bar, easy chairs and a wall mounted TV. 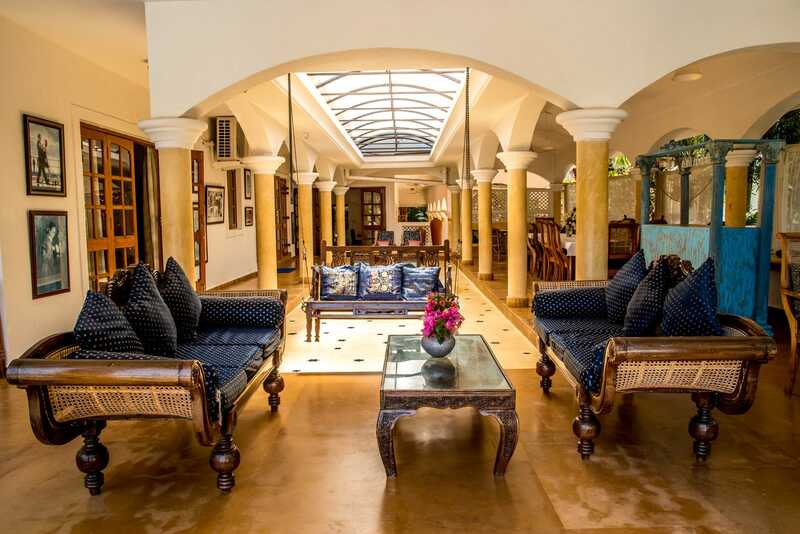 In the adjoining wing is the large sitting room with antique sofas, fine paintings, TV and a secondary dining area, with adjoining cloakroom and washroom area. 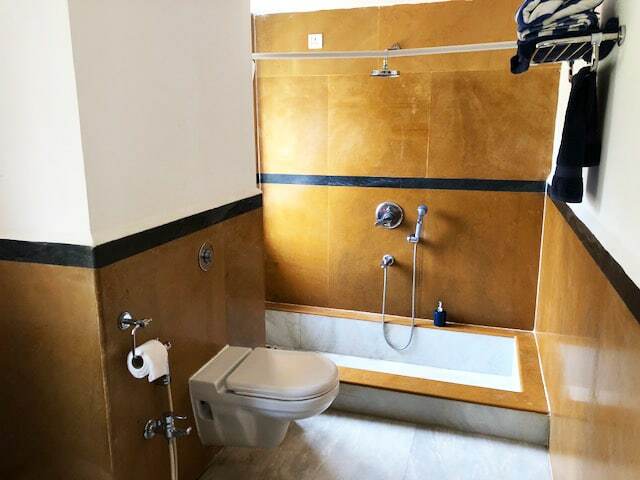 This room opens out onto a discreet garden courtyard with small water-body with fountain on one side and the covered main courtyard on the other. 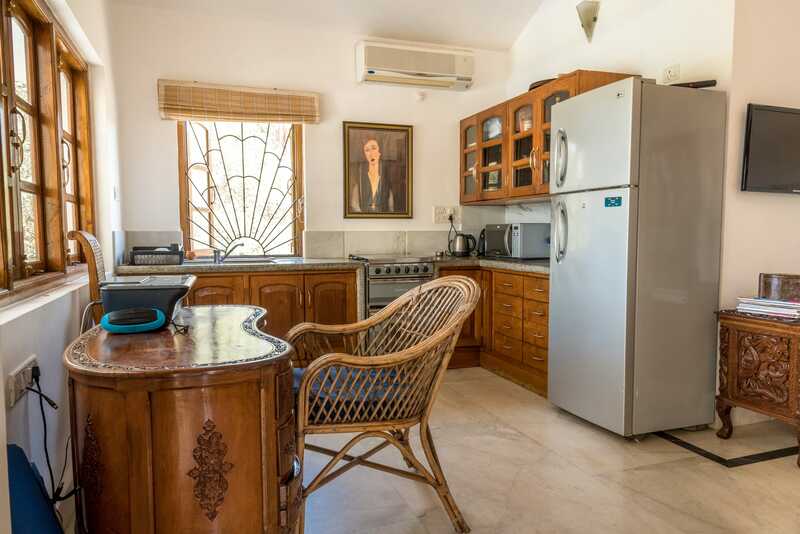 Adjoining the sitting room is a downstairs ensuite double bedroom particularly useful for easy access if someone has mobility issues in climbing stairs. 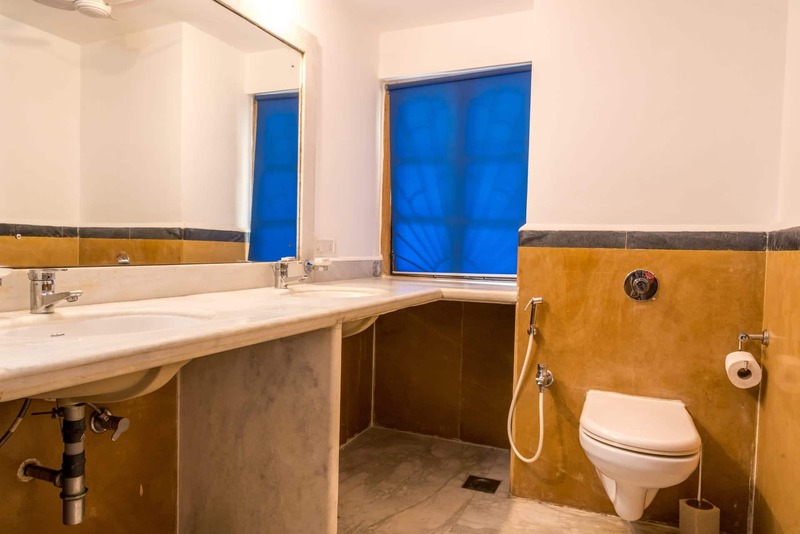 Upstairs are 3 ensuite bedrooms with specially made 4 poster beds and built in or antique wardrobes. All these bedrooms open out on to the marble balcony. 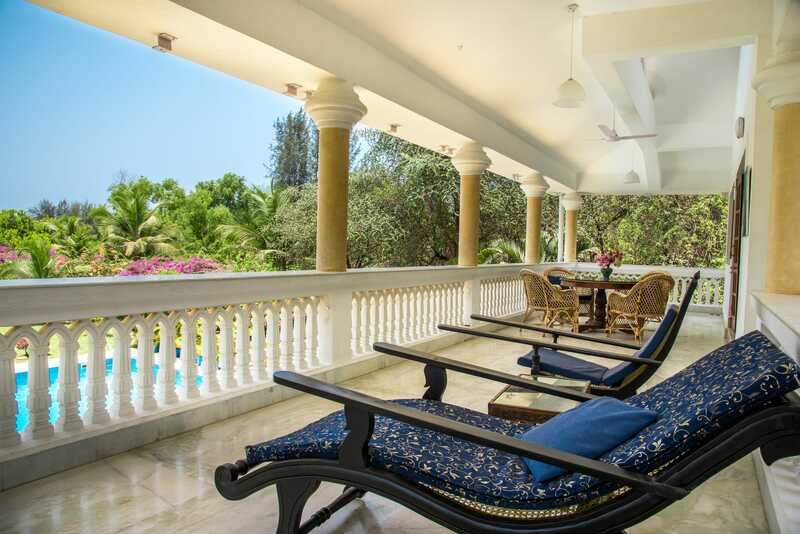 The sea facing outside facade is beautiful and overlooks the many large granite statues. 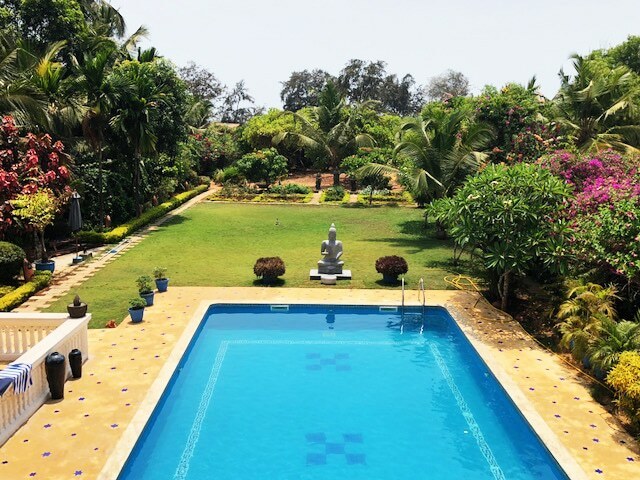 These include a 5 foot granite statue of The Buddha in teaching pose, overlooking the swimming pool, which was specially commissioned for the villa, and towards the beach, in the lee of the Cashew tree is a large statue of Garauda, the winged god of Hindu mythology and legend flanked by 2 temple guardians. 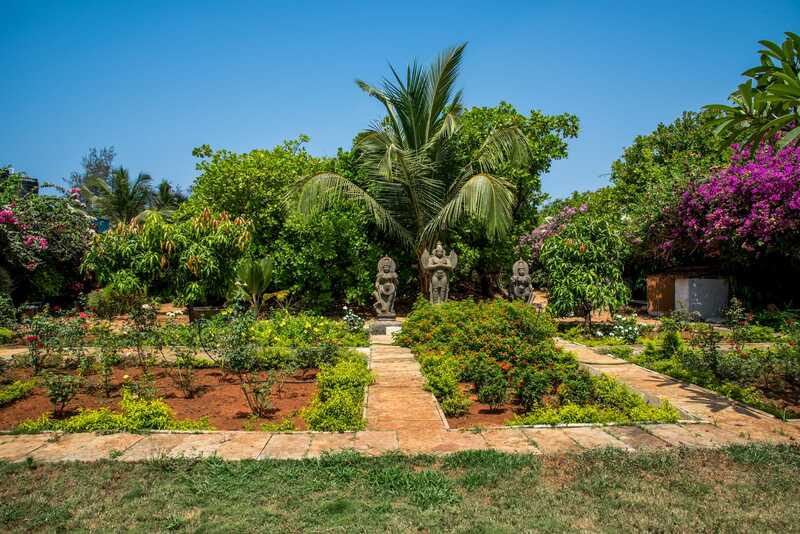 There is lush greenery all around the villa with lots of flora and fauna with Bougainvillea covering the compound borders. 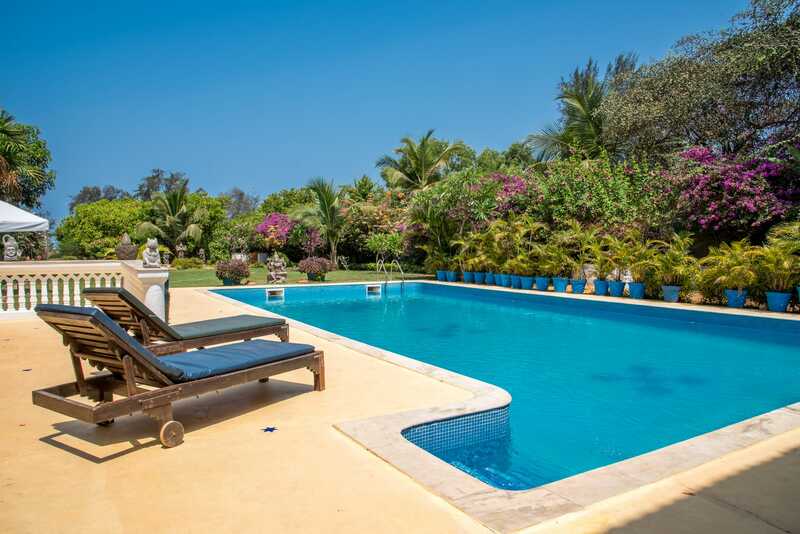 The swimming pool is very serene and completely private and not overlooked by neighbours. 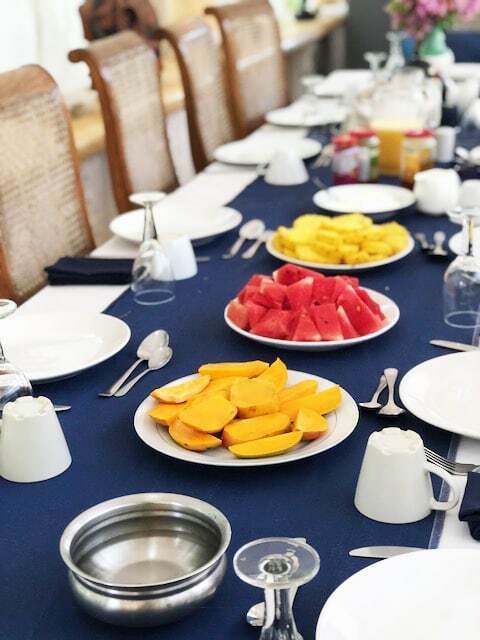 The villa is particularly suitable for having a wonderful and memorable time with family and friends when marking special occasions or just having a special break. It has been the setting for a number of small weddings. 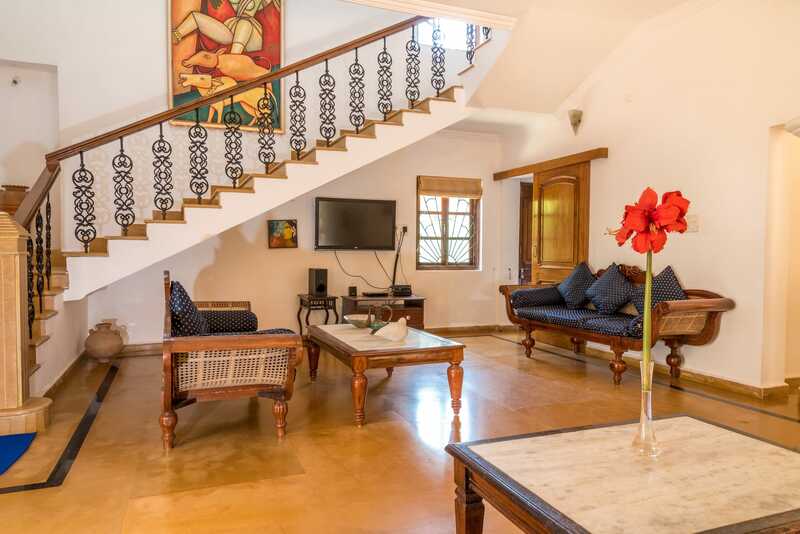 We hope you all have an amazing and most enjoyable holiday in this lovely villa/home in one the most desirable and sought after beach side location in Goa.